Last we properly heard from Imogen Heap’s proper journey to creating her fourth solo album, was through a #heapsong titled “Xizi She Knows” and a collaboration with EDM’s Deadmau5 for his closing track “Telemiscomunications”. The “Xizi…” article was a tough one to write. While it was a glamourous track in its own compositional and culturally exploratory right, time constraints hindered the mixing process, causing the track to suffer an insufficient balance of low-end frequencies. “Telemiscomunications” was confirmed through both artists to be both part of Joel Zimmerman’s latest record >Album Title Goes Here< as well as the unnamed Heap record. Imogen also paired up to present a mini-documentary on a song not yet released entitled “Me The Machine” that is a must watch for music and technology fans. Throughout the span of the feature, it shows Imogen and a crew attempting to put together a musical instrument called The Gloves and the struggles to put together a show to be debuted live directly after the film. It’s a darker side of Immi, who dedicates her all and neglects sleep to piece together this instrument that senses hand movements and connects them with instruments, effects, and other musical pieces within Ableton and elsewhere. In fact, the technicalities with the song were so direly important to fix that instead of jumping right into a performance, the premiere of Love The Earth (which Imogen scored) was premiered as a bonus present to tuned in fans and time buyer for the Machine project to work out its kinks. And now we have “You Know Where to Find Me,” a strongly piano based song featuring thirteen different pianos in thirteen different houses throughout Edinburgh (The Space has placed together a great mini-site in dedication to this journey. You can see that here) and shines brightly in it’s view of writing a song to describe the River Thames on the South Bank. “This whole song is written about the river to have this still moment with us,” Imogen proclaims through the “You Know Where To Find Me” bundle which is available along with an instrumental, video, and Streamliner (formerly known as 3DiCD) through her official website. In regards to mixing, it’s certainly not still when it comes to creativity. It’s great use of room space, natural & outboard reverberation, and volume control compression techniques shine each piano’s different character into one great mix and is then conservatively mixed to ensure that though they’re suited into the same sonic universe, their diversity amongst instrumentation and up-keeping are characteristically and clearly heard. The lead vocals are the bits that are given the most attention and are uniquely used to create a low end buy placing precedence on them over every thing else in the mix. The entire spectrum of the vocal world is heard crisply, and is all controlled using intelligently used equalization to weed out areas that would conflict with the various instrumental parts. Ironically, the vocals do get drowned toward the bigger, more layered portions of “You Know Where To Find Me,” and we can’t help but to think this is greatly intentional. After all, this is a song about a river and what better way to paint a sonic canvas than to do it chaotically through the mixing process? A bit more subtle is the ending lyrics, which fade away slowly and euphorically before all that’s left is a the ending piano melodies. Imogen’s record seems to be shaping up quite nicely. The bumps in the road are few and far in between and are just speed bumps toward a project that’s spanned from city to city, country to country, and all ultimately from the head of Imogen and her collaborators. It’s all creatively connected so far and the guesses toward the next step in the #heapsong/untitled album are interminable, unforeseeable, and extremely anticipated. This entry was posted in track review, Uncategorized and tagged #heapsong, >Album Title Goes Here<, Deadmau5, Imogen Heap, Love The Earth, Me The Machine, You Know Where To Find Me. Bookmark the permalink. 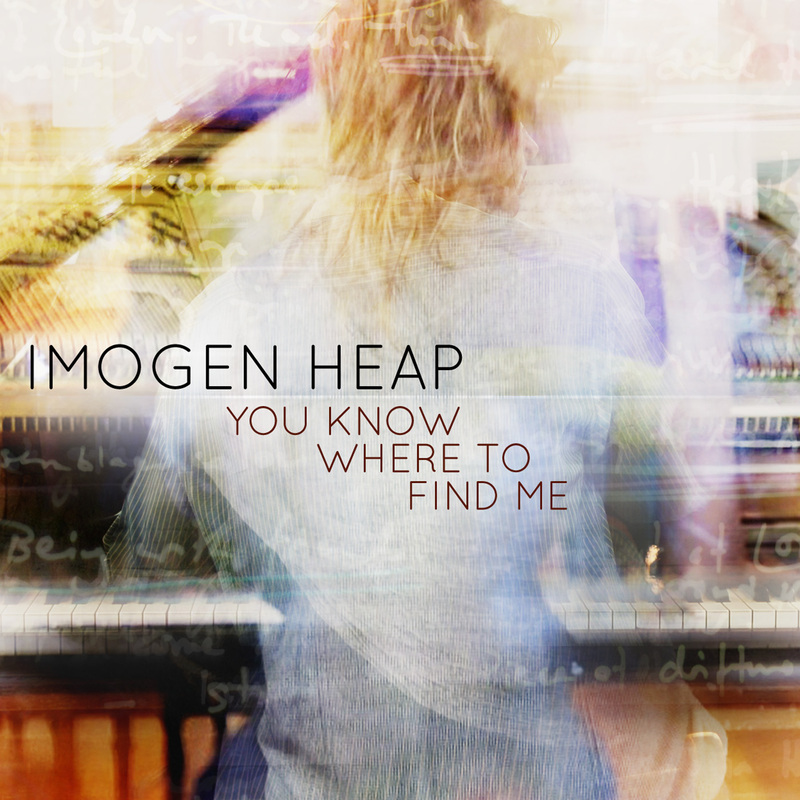 6 Responses to Track Review: Imogen Heap – You Know Where To Find Me & #Heapsong Updates! Another Heapsong has been premiered live but not yet released (or probably recorded). ‘The Listening Chair’ was performed at a BBC Proms concert (in August, I think). It has a choral arrangement by Eric Whitacre, the American composer and conductor The arrangement follows very closely a studio demo of the first 2 minutes which Imogen posted online. Each of the five minutes of the song is based on 7 years of Imogen’s life, starting with a kind of lullaby, and ending rather darkly ‘where did it all go wrong’! One other Heapsong, ‘Entanglement’ has already been recorded (originally intended for a film but not used), but not publicly revealed, and one or possibly two instrumental tracks recorded for a film about Bhutan. That makes 11 or 12 tracks already written and/or recorded. Finally, Imogen has said she will be writing a song which will also be the basis for an RJDJ generative app. And in her last live stream (which is on YT here http://www.youtube.com/watch?v=zNuLnclz37M&noredirect=1) she hinted that there might be one more song but she wasn’t going to say more about it yet. She also said the planned release day was now May next year, and she wasn’t going to rush it..